A computer is basically a calculator: its goal is to detect inputs or signals of interest (e.g. key pressed) and turn it into an event (e.g. open a program). Its main application consists in executing a series of instructions ( alogorithm ) and provide a varying visual feedback from what it is given in entry (Human Interface Device). Some of the oldest algorithmic concepts found in human history come from the Greeks Euclide and Ératosthène in 300 DC, and very complex mechanical technologies of analog calculators were found as old as 87 DC with AntiCyther' machine, used for astronomy measurements. They basically all handled a clock system that would continuously evaluate the system state and react to given User Inputs by variations of feedback depending on the use of the computer. Most Tehcnologies slowly evolved from mechanic, to electromechanic until becoming microsized electronic devices enabling to perform billions of calculations at extreme speeds, and to be programmed and reprogrammed at will. Today, we are reaching the step of nanosized computers industrialisation, and computers efficiency is about to be demultiplied by technologies issued from quantum physics. Open source hardware resources have been recently developed to open these complex technologies to general audience, under the form of accessible technological bricks such as Arduino Boards and Shields ( LilyPad ) , providing highly customisable DIY solutions, and a good way to understand what a computer is made of. 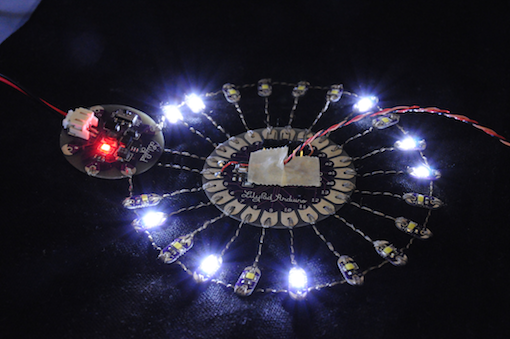 The Lilypad is among the most successfull variation of Arduino Development Board. It was especially designed for producing custom e-textile interface using conductive threads and addapted shields and components.